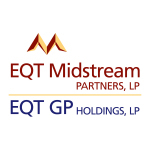 PITTSBURGH–(BUSINESS WIRE)–EQT Midstream Partners, LP (NYSE: EQM) (EQM), an EQT Corporation company, announces the filing of its Annual Report on Form 10-K for the fiscal year ending December 31, 2016 with the Securities and Exchange Commission (SEC). The report is available on EQM’s website at www.eqtmidstreampartners.com and on the SEC website at www.sec.gov. EQT GP Holdings, LP (NYSE: EQGP) (EQGP), also an EQT Corporation company, announces the filing of its Annual Report on Form 10-K for the fiscal year ending December 31, 2016 with the SEC. The report is available on EQM’s website at www.eqtmidstreampartners.com and on the SEC website at www.sec.gov.